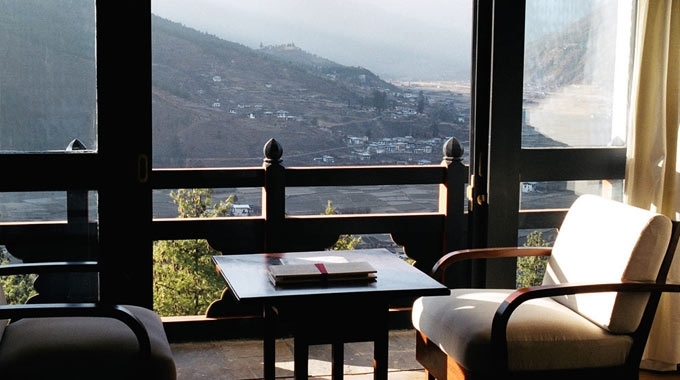 A stay at Uma by COMO, Paro is about immersing yourself in the richly textured culture of Bhutan while enjoying the luxuries of a COMO resort. 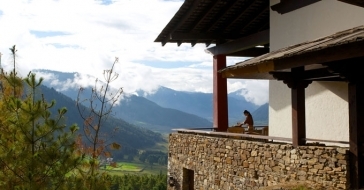 With the resort’s Paro Valley location, guests can easily access the highlights of this Buddhist country, from Tiger’s Nest monastery, clinging to a cliffside, to a morning spent browsing Thimpu’s museums, monasteries and markets. 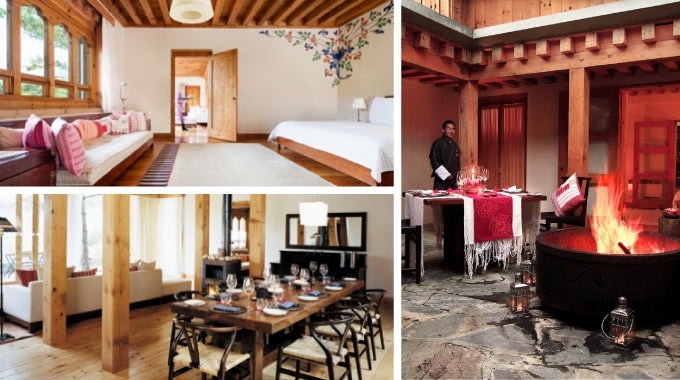 The nine private villas and 20 luxury rooms combine the colourful accents of traditional Bhutanese craftsmanship with the clean-lined contemporary design for which COMO Hotels and Resorts are known. Other luxury amenities include a spa and award-winning cuisine. These comfortable double rooms overlook the pine forests and feature king-sized or twin beds, handpainted traditional Bhutanese wall designs and a well-appointed bathroom with combined shower-bathtub (25 m²/269 ft²). 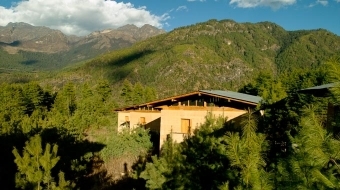 These rooms provide undisturbed views over the Paro Valley. 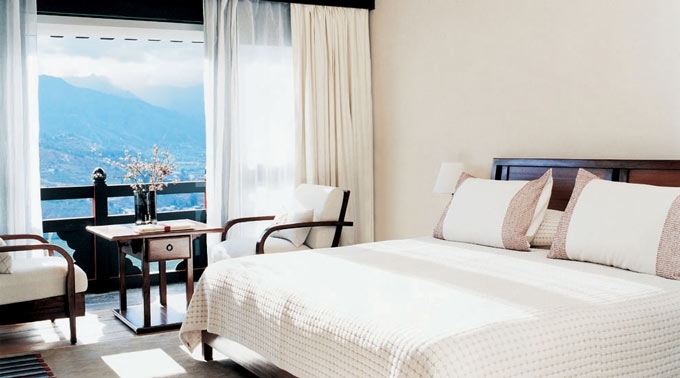 Rooms feature a king-sized bed and generous bathroom with bathtub and separate shower stall (32 m²/344 ft²). The stately COMO Villa is our two-bedroom headline suite. 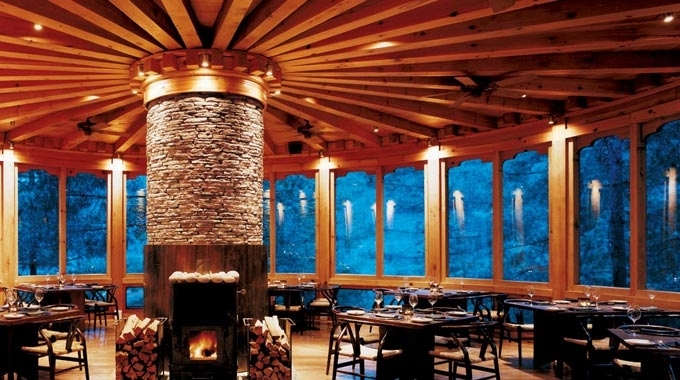 A large living area opens up to panoramic views of the Paro Valley, while an alfresco hot stone bathtub and an open-air courtyard with fire pit tempt you to cosy up outside whatever the Himalayan weather. Back indoors, a spa treatment room means you have very little reason to leave your private domain. There is a full kitchen, a dining area seating eight, and numerous one-off design details and antiques that instil this villa with a strong sense of Bhutanese culture. Note this villa always includes the 24-hour services of a private COMO butler. Please contact us for the rates of other room types. • Price is inclusive of breakfast and dinner, and 20% tax & service charge, excluding all beverages.